The one mental skill necessary for top performance in tennis is the ability to maintain your focus on the present moment. In order to play your best tennis, you must be able to control your thoughts and focus your attention on the right things. Phrases such as “playing in the moment” or “being in the here-and-now” refer to an athlete’s ability to let go of past performances or fears about future outcomes and immerse his self in the present moment. It is easy for negative thoughts to infiltrate your head. 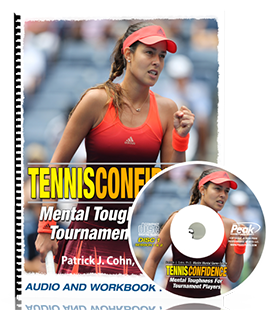 In order for you to be a productive tennis player, you need to be able to focus your thoughts on the very things that allow you to play optimally—what we call execution. Thoughts such as, “Last time I played at this tournament, I played horribly,” “I never have beaten this opponent,” or “I have played poorly lately,” are thoughts focused on past performances. 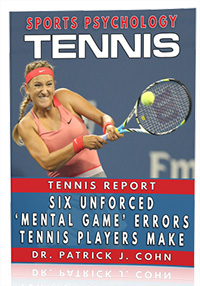 When a tennis player is preoccupied with past performance, it interferes with their focus on “the current match” or “the current point” and increases anxiety leading to a downward spiral of negative thoughts. There are three periods of inaction in tennis matches (pre-match, between sets and between points) where it is critical for a player to maintain a “present moment” focus. The largest chunk of time where you have lots of time to think is before the match. In order to control your thoughts and focus prior to a match, it is important to have a pre-match routine. You should seek to develop a warm up routine that you can replicate prior to every match. You want include activities (listening to music, reading) that help you stay loose and calm prior to warm up. However, some players would benefit from getting pumped up to focus their best. You want to stay focused on your warm up instead of worrying about the match outcome. Think: How can I best prepare for the upcoming match? By controlling your focus and “staying in the present moment,” you will increase both your enjoyment and your level of play. Improve your focus in sports today with The Focused Athlete Workbook and CD Program!